How to grow tall bamboo will depend on your definition of tall. 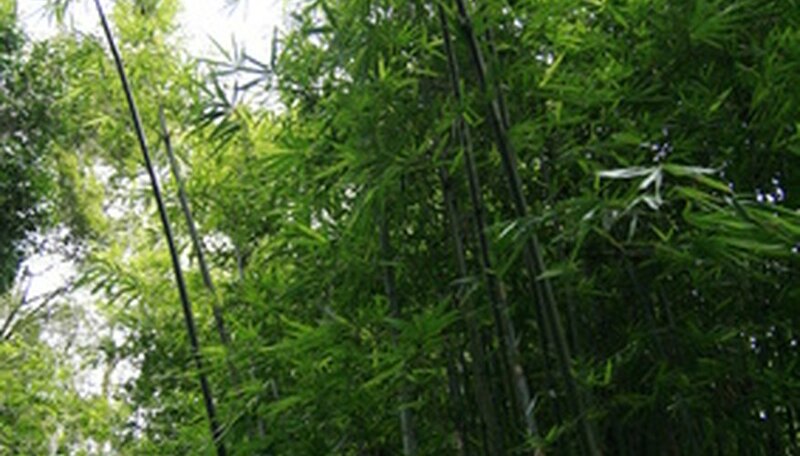 Many bamboos grow to between 15 and 25 feet tall. A few varieties can grow to around 70 feet tall. Whether or not very tall bamboo will grow in your area will depend on your climate zone. Larger bamboos rarely grow in zones colder than United States Department of Agriculture hardiness zone 6. Some won't do well in areas that drop below freezing. It is important to select a bamboo that can survive in your climate. Dig out the soil in the area where you will plant the bamboo. Dig down to 3 feet. If you are trying to plant a small area with very tall bamboo, a shovel might be adequate. However, if you are planting a large area, renting a small backhoe or skid steer loader may be necessary. If you aren't concerned about the bamboo becoming invasive, you can prepare only the area where the bamboo will be planted and skip step 2. Line the perimeter with a bamboo barrier. Bamboo barriers are usually plastic, but some growers use a poured-concrete barrier. Larger bamboos usually reproduce by rapidly spreading rhizomes. Those rhizomes can become invasive. If you are planting your tall bamboo in a formal, manicured landscape, you need a barrier. If the bamboo will grow in the middle of an unmanicured field and you don't mind the bamboo eventually taking over the field, you might not need a barrier. If you have any doubts, line the area where the bamboo is going to grow with a barrier. Backfill the area to within 8 inches of the surrounding soil. Lay the bamboo rhizomes with the eyes up and cover the planting with 8 inches of soil. Use 1 or 2 inches of mulch to help the soil retain moisture and help reduce problems with weeds. Water the planting thoroughly with 2 to 4 inches of water. Keep the soil moist, but not drenched, until the bamboo comes in. Once it has begun to become established, keep the planting mulched and give the grove a couple of inches of water whenever the top 1/4 inch of soil feels dry. Be very careful about planting bamboo without a barrier. If you are considering not using a barrier, talk with your supplier about the speed with which the rhizomes will colonize new land.